Moonstruck Shiner, a daughter of Houston Shine, born on the May 5, 2012, Super Moon night. 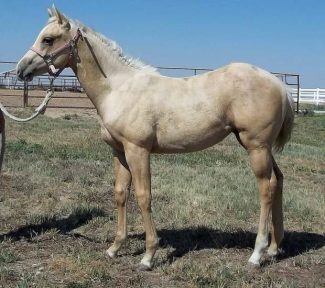 Houston Shine, a 1994 sorrel stallion, has earned more than $60,000 in reining, and 182 AQHA points. 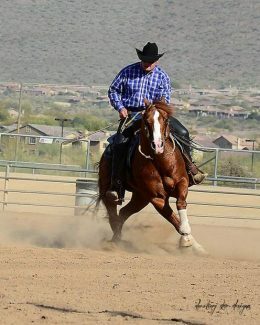 Houston and Brown perform a sliding stop, another maneuver in reining. Brown and Houston Shine practice their spin, one of the maneuvers in reining. 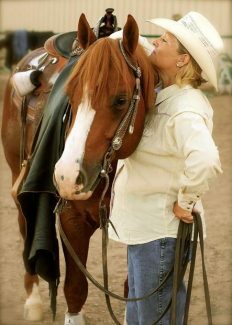 Sheryl Mease, owner of Houston Shine, takes a moment with him at a show. Brown has collected a large number of awards, trophies and ribbons while in the reining circuit. Brown and Houston Shine competed at the 2012 World Equestrian Games in the freestyle reining event. Horses have a special way of finding their way into someone's soul. Once that initial contact is made, it's not an easy bond to break. This is what happened to Shane Brown of Elbert, Colo. His life has never been the same. Brown grew up near Blackforest, Colo., on a cattle ranch. They used horses on the ranch, but it wasn't until he went to work at Pine Run Ranch at the age of 15 that his focus changed. Under the direction of Troy Heikes, Brown found his calling. "When I started there, I originally went to learn more, so that I could train my own horses on the ranch. I didn't know there was this horse world of showing, and they showed me that when I went to work there," he said. He continued, "When I saw that world, I saw something that I enjoyed. I knew then I didn't want to chase cows; I wanted to train horses. I feel pretty lucky that I had that opportunity." Brown then spent six years training under Heikes. Just short of his 21st birthday, Brown made the decision to strike out on his own. "It wasn't planned. It just worked out that way," he stated. 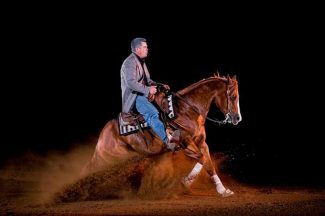 Brown then created Shane Brown Performance Horses, and he focuses on training reining horses, and also trains cow horses when he has the time. He is drawn to reining because of the technicality of the sport. "I like how it's technical. That's probably what draws me to it the most. It's something that is unique to us, and our western way of doing things. It's like Western dressage," he said. 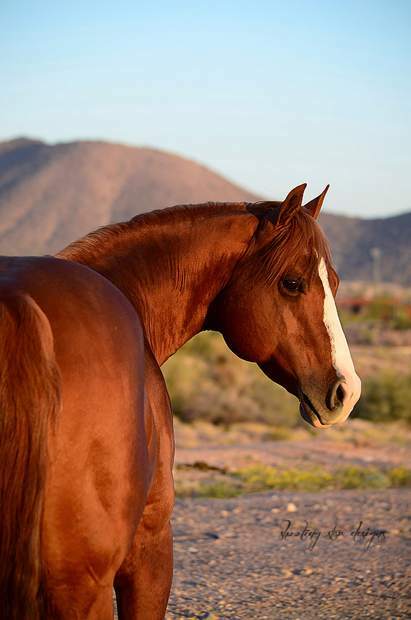 Brown trains horses of all ages, from unridden colts to seasoned show horses. "It is extremely different training at both ends of the spectrum. A horse that is young is still naïve. They aren't trying to outsmart you. You try to help them build confidence, and you tell them what to do. With an older horse, you have to tell them what not to do, because they try to outsmart you," Brown explained. With the younger horses, Brown is patient and gives them time to learn. "I don't want to rush my 2-year-olds. We always make time for those young horses, and give them enough time to learn. It also gives us time to figure them out," he said. He continued, "If we are in a little bit of a hurry, we are not slowing our brain down enough to learn how to work with their brain. You have to take your time. If you need to sit with them a little more, that's OK. A lot of time with horses we are in a hurry. Patience should be at the top of our list." The way that Brown trains is different than many other trainers: he focuses on training them mentally. "There are two ways to do things. There is physically training, where you pick them up and put them where you want. There is also mental training. In this, you train the steps to the horse, and hope they start putting it together. It teaches them to think more through their actions instead of reacting," he said. This method of training helps the horses to stay in the show pen longer, because they don't get sour. "We have a lot of horses that we have trained for a long time. The ones that have the desire, it makes them that much better of a show horse. They know how to do their job, so you have to keep them mentally and physically sound. You want them to enjoy their job, and that's a challenge and I enjoy that," Brown said. When prepping for a show, he wants to make sure his horses are ready before he ever leaves. "In the weeks before the show, I want to make sure that my horse is trained and doing all the parts individually. Showing is a mental game, and you have to have that. Some people compare it to another mental game like golf. 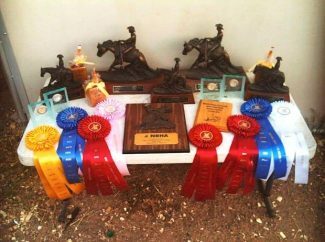 We have enough to think about and prepare mentally once we get to the horse show that the horse needs to be ready," he said. His training techniques have led to his success as a NRHA Futurity Intermediate Finalist, AQHA World Show Finalist, an APHA World Show Championship, multiple AQHA World Show Qualifiers and Regional Championships. One of the horses that Brown has been training and showing for nearly five years is Houston Shine, a 9-year-old stallion. This dual has competed in competitions across the country, and in several different classes. "He has a huge heart and a lot of personality. A lot of horses at his age who have done this many runs are really hard to show. They have done it so many times they try to outsmart you," Brown said. He continued, "He and I have a great relationship. He's one of the family. I've been very blessed to have him in my life. One of the biggest reasons he is one of my favorites is his mental ability and his personality." Houston is focused on his job, and when he moves, it's always fluid. "Everything that Houston does is finesse. When he is very successful, it is because he made no mistakes and he is very pretty," he said. One of Brown's favorites events to compete in with Houston is the freestyle competition. 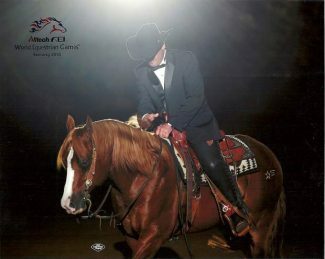 Unlike a traditional reining pattern, during freestyle competition, the riders are allowed to create their own pattern to music, and many times the riders and horses are dressed up. "The biggest thing I enjoy with freestyle is the crowd, and watching them enjoy the event. Freestyle has brought in a lot of people to reining. When they see how goofy I am dressed, they wanted to stay and watch. I don't necessarily like making a fool of myself, but it makes people happy," Brown stated. Brown, who was shy growing up, and never felt like he was a natural born performer. "When I went to my first show by myself, I realized I couldn't be shy. It's still hard for me. It's not me, and it takes a lot for me to step out there and be that goofy. I'm not naturally drawn to be an entertainer. Houston, however, is a ham," he said. He continued, "We found that we are good at it. I try to find something that isn't always comical, because then I don't have to be a ham, I can just ride my horse. It's a lot of fun, however."